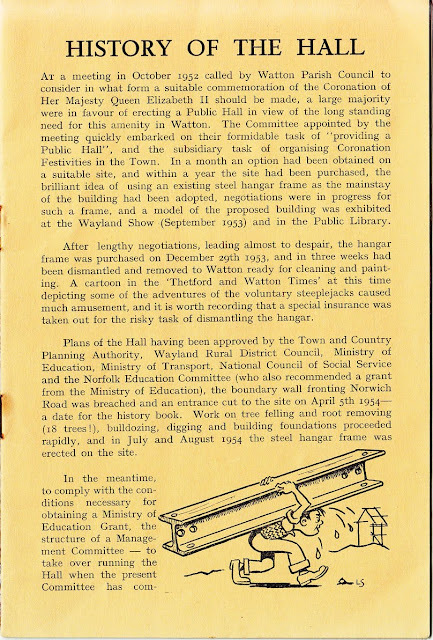 Following the Wayland Heritage Discovery Day at Queens Hall last Friday it seemed a good time to start looking at the history of the hall. We are lucky that a copy of the original 1956 souvenir programme has survived in Lesley Cowling's family collection of Wayland documents. 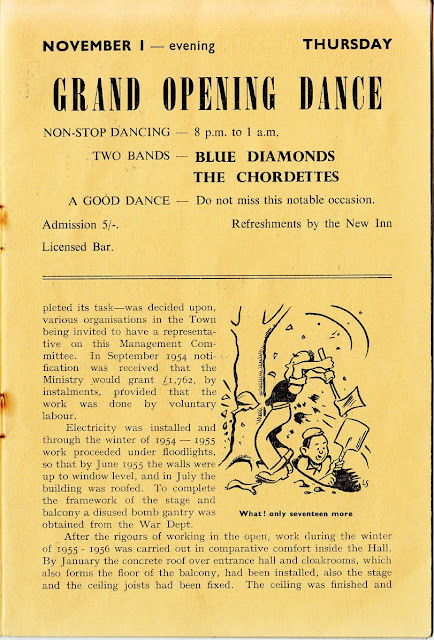 The three pages that give a history of what was then called 'Watton Coronation Hall' have been added here. The full programme has been scanned and can now be read online (in the window above) and downloaded from Google Docs, if you click on the small icon top right in the window above you can see it in a larger window, click on File, top right, and you can download it free from there. 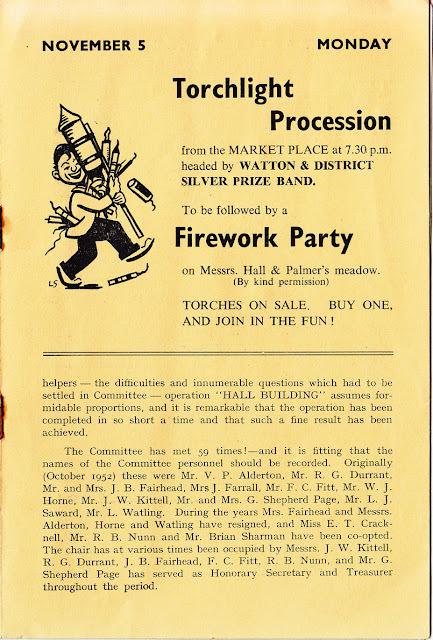 * It was three year community project, centered on Watton and the surrounding parishes, which aimed to explore, record and celebrate Wayland’s unique cultural and landscape heritage. * The project worked with local schools and history groups, providing support, activities and training. It will also helped set up new interest groups where they do not already exist. * Topics explored include: landscape history, archaeology, myths, buildings, oral & family history, trades, crafts, fairs, sport, traditions, farming, ‘Battle Area’, airfields, transport, religion, food and fashion. * The ‘Capturing our Wayland Heritage’ project helped the local community to create a Wayland archive in the form of 13 books and data DVDs that will be a legacy for generations to come. * The results of the project will be shared with the community and visitors to the area. 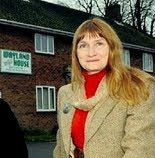 * Revealing Wayland’s hidden heritage will help the local economy by encouraging more tourism in the area. Archant Norfolk Newspaper Library - Open times and fees etc.